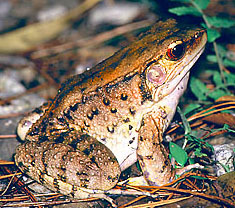 The Dagger frog is a large frog that lives only in the mountainous district of the northern region of Okinawa proper and Tokashiki-Island. A forefoot with five toes is its distinctive feature. The first toes are spiny and a scratch from them is like being cut with a knife.